Millions and Billions of… Something? It’s accepted as fact that your reach and impact on social is directly related to the numbers of views, likes, fans, followers, retweets, and plays your posts receive. With 18 years of experience at Cox Communications, Martin heads a team that oversees the evolution, placement, and evaluation of social that appeals to several different verticals. From residential services to schools to hospitals to sports stadiums, Cox has many different consumers that are all looking for different things at different times in different places. On the surface, their millions of followers would give you the impression of a robust social plan that works. But that is not the whole story. 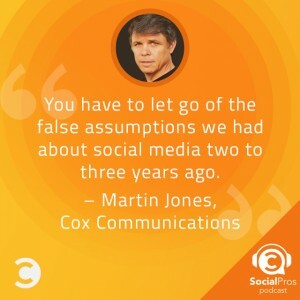 Martin saw through this false front and realized the age-old way of measuring success on social was not helping them to engage with their customers. Through some tough scrutiny and willingness to confront the status quo, he rebuilt the brand’s approach to social and has seen traffic double and a sharp rise in return rates as customers begin to engage with actionable content. It’s important to chart your course and be willing to take risks in this field. If there is a platform or tactic that appeals to you, then jump in and try it out. Never stop learning. You need to move at the speed of social otherwise you’ll get run over. Martin takes us back for this one; way back to his high school wrestling days with coach Bob Buzzard in Oregon. Former Olympian and inductee to the Iowa Wrestling Hall of Fame, Bob instilled Martin with the knowledge that you learn more from losing than from winning. Losing is going to ultimately make you better. He was also fond of saying “Show me your friends and I’ll show you your future”. Taking a Skype trip down memory lane with Bob would be a moving experience.